A few weeks ago while driving into town I saw the weirdest bunch of things crossing the road. Of course, two were promptly adopted by our girls. And our new pet’s names you ask? Now THAT’s a fuzzy caterpillar! Oh how cute! I love their names. They’re perfect! And I love the photo. The color and texture makes it so dreamy! Fuzzy/furry critter “pets”. This is a great capture and so cool that they are now part of your family. Love your photo, the composition and the beautiful tones! This is just incredible. I love it! Wow I LOVE this picture! What a sweet photo! Can’t wait to see the final result of their new pets! I love this! Creepy crawlies are so awesome! Awesome capture and I love the processing. love the processing on this! 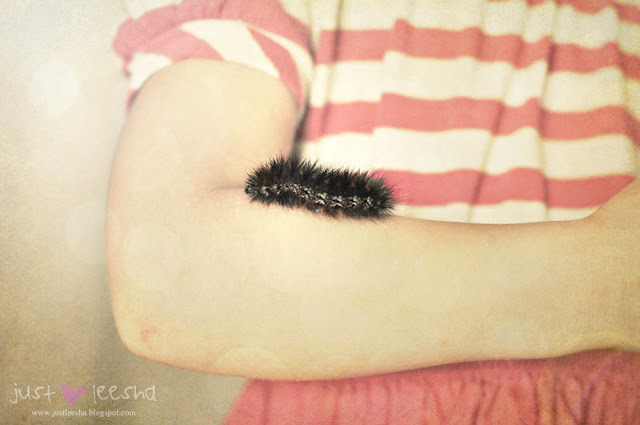 Caterpillars are such intriguing little creatures. Love the vintage feel of this! Very creative, love the macro shot of the caterpillar. I knew this would be a winner as soon as I saw it! Amazing photo! Congrats!! Congrats on being a winner at I Heart Faces! Love this shot!